American Coopers 3 cent stamp U.S. 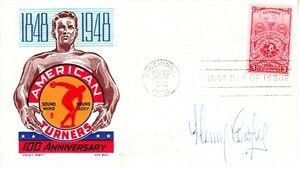 Postal Service 1948 First Day Cover autographed in blue ballpoint by the late English boxer Henry Cooper (died 2011), perhaps best known for losing 2 close fights with Cassius Clay/Muhammad Ali. With certificate of authenticity from AutographsForSale.com. ONLY ONE AVAILABLE FOR SALE.